Greg Schwartz, Class of 1991, wrestled on three state championship teams for the Bulldogs during his high school career, as well as winning an individual state title as a senior. During his five-year career as a varsity wrestling starter, the Dogs went 110-5 as a team, winning three state titles (in 1987, 1990, and 1991) and finishing third twice (in 1988 and 1989). As a senior, he led six individual state placewinners for the Dogs by winning an individual state championship at 140 pounds. He is the only wrestler to earn four state championship medals during his high school career (three with a team and one individual). In 1987, as an eighth grader at 98 pounds, Schwartz helped the team win its first state title by yielding only a major decision to a state champion from Staples, as the Dogs beat Staples 22-20 in the state semifinals, eventually winning their first state title. He was 17-12-2 as an eighth grader and 29-7 as a ninth grader. By his sophomore year, he had the most varsity experience on the team and was named MVP and placed fourth in state individually, going 36-5-2 as the Dogs placed third at state. He went 37-5 as a junior, making state but not placing, as the Dogs went 24-0 to win their second state title, and 38-0-1 as a senior, becoming the first PAHS wrestler to win a team and individual title in the same year. He won four conference titles and was also named to the first team All State Academic after his senior season. He ended his five-year varsity career with a record of 157-29-5, holding the school record at the time for career wins and winning percentage (.881). His record for career wins lasted for ten years, before being eclipsed by David Kerzman in 2001. He still ranks third in career wins and third in winning percentage among wrestlers with at least 100 wins. Schwartz also played football and baseball for the Bulldogs. During his senior season, he earned All Conference honors in football at running back and cornerback as the Dogs went 6-2 in the West Central Conference South and tied for the conference title. He rushed 153 times for 682 yards his senior year (second on the team) and seven touchdowns. He also completed 10 of 18 passes for 207 yards and four touchdowns. He started in leftfield for the Bulldogs in baseball his senior year in 1991, hitting .207 with nine RBIs but leading the team with 17 bases on balls and scoring 12 runs. The Dogs won the district title for the first time since 1977 that year and reached the district final before losing to Rocori in the region final. The Dogs sent a school record, at the time, with 14 wins that year. Schwartz wrestled for one year at the University of Minnesota-Morris and reached NAIA nationals at 157. 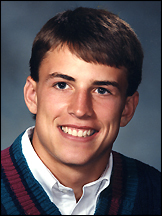 He was killed in an automobile accident in June 1992 after his freshman year at college. What is your fondest memory from high school? The socializing, camaraderie, and competing with friends and teammates. A couple things that stand out to us about Greg. We often hear comments from his peers and other adults about his friendly smile and outgoing personality. We also remember Greg for his love of competition. He had a very competitive approach to any activity. He not only had a burning desire to succeed at a very high level in the sports he played in high school, but he also loved trying to excel in any activity. Whether it was pick-up basketball, waterskiing, hunting, table games, etc., Greg loved to compete.